Technicians fasten down the flanges of the aerodynamic tail cone on Space Shuttle Atlantis as final preparations are made for its ferry flight from Edwards Air Force Base to the Kennedy Space Center near completion. NASApostponed a cross-country trip home from California for the space shuttleAtlantis to no earlier than Monday due to bad weather. Atlantislanded in California on May 24 after foul weather thwarted repeated attempts toreturn to its home port at the Kennedy Space Center in Cape Canaveral, Fla.,following a successfulmission to repair and upgrade the Hubble Space Telescope. Thunderstormsand high winds prevented plans to begin flying Atlantis back home early Sundayfrom the backup landing site at Edwards Air Force Base in Southern California. The$1.8 million ferry flight is now slated to begin Monday at 8:20 a.m. EDT (1220GMT), though it should be just before sunrise local time in California. 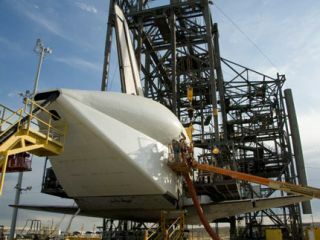 NASA willreturn Atlantis to Florida atop one of its two modified Boeing 747 jumbo jets,which have been converted to allow a 100-ton shuttle to ride piggyback for thetrip home. The flightis extremely weather dependent, since carrier craft cannot fly through rain,turbulence or extreme cold in order to avoid damaging the thousands of heatresistant tiles lining the shuttle?s belly. The ferry flights typically makestopovers at military airbases while awaiting favorable weather, and can fly aslow as 10,000 feet (3,048 meters) to seek out good conditions. ?Flightmanagers are looking at various options for the best route to the Kennedy SpaceCenter,? NASA officials said in an update. ?Weather remains very dynamic.? Atlantis isreturning to Florida after a 13-day flight that marked the fifth and finalservice call on the 19-year-old Hubble Space Telescope. While shuttletechnicians prepared the spacecraft for its trip home, Atlantis? sister ship movedinto position for its planned June launch toward the InternationalSpace Station on Sunday. Endeavouris slated to launch a crew of seven astronauts to the station on June 13 todeliver the last piece of outpost?s massive Japanese Kibo lab. Five spacewalksare planned during the 16-day mission. Video - Emergency Drill: Danger on the Launch Pad!